Everyone loves a bit of Cthulhu, right? He’s a tall, dark and handsome Elder God with tentacles for a face, plus he sends anyone who sees him insane at first glance and then eats them. Probably. 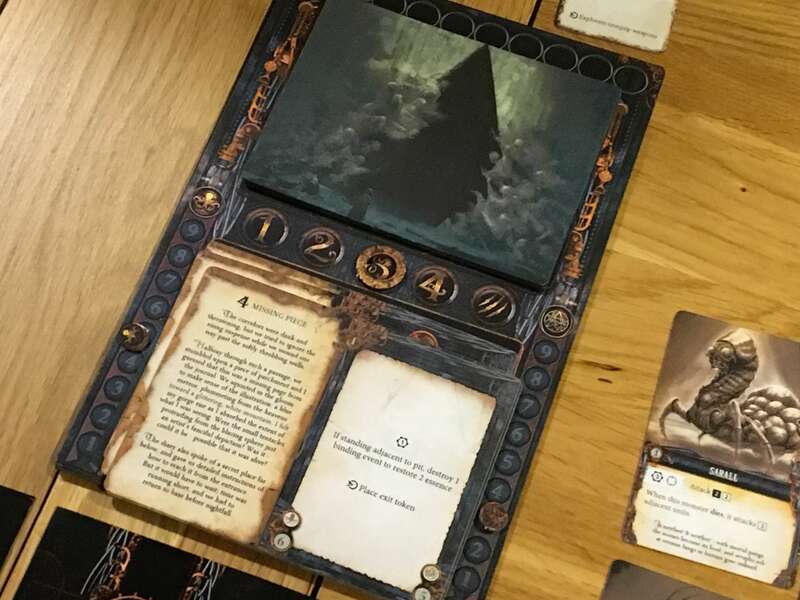 The world of H. P. Lovecraft has been the inspiration for many a board game over the past few years, though many of them deal with the subject either indirectly or in an abstract way. Machina Arcana (now in its second, revised printing) tackles the subject directly, as a classic dungeon crawler. Find out if it’s any good in our exclusive preview. Machina Arcana is the kind of increasingly popular adventure game that supports one to four players, with no one ever controlling the subterranean hordes of Cthulhu unless their character has already died (or unless they really, really want to.) As a result, the game is just as playable in either solo or cooperative modes and it scales at all player counts because enemy spawning, power level and movement is linked to every player turn. 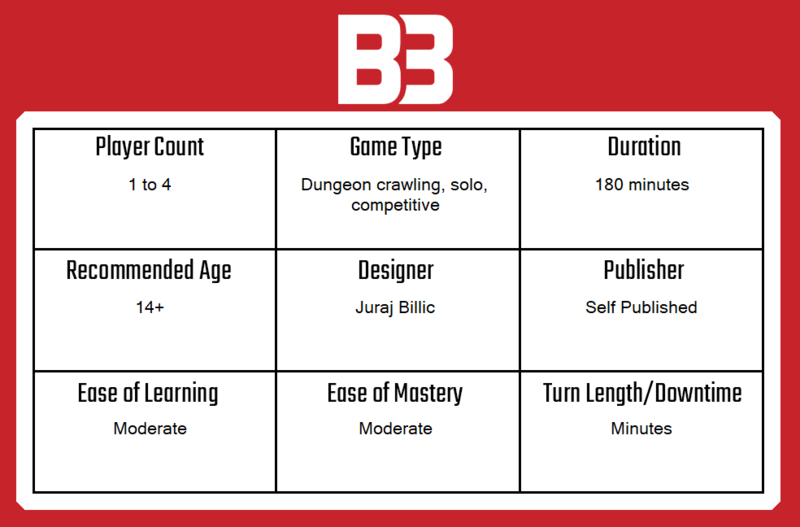 The game is split into three scenarios, each of which comprises a number of chapters. The version that I’ve been testing features only the first scenario, but it’s enough to give me a feel for how the finished article will play. Effectively, the chapters in each scenario are presented as cards that are turned over and resolved as and when the appropriate condition is met. Each one contains both a narrative flow and one or more gameplay effects, some of which help the players and some of which hinder them. As you’ve probably guessed, the further you progress through the chapter deck, the more complex and challenging the scenario becomes, but whilst enemy strength and the likelihood of spawning can be affected by the chapter card, actual spawning happens at the end of every player turn and depends on the roll of a dice. 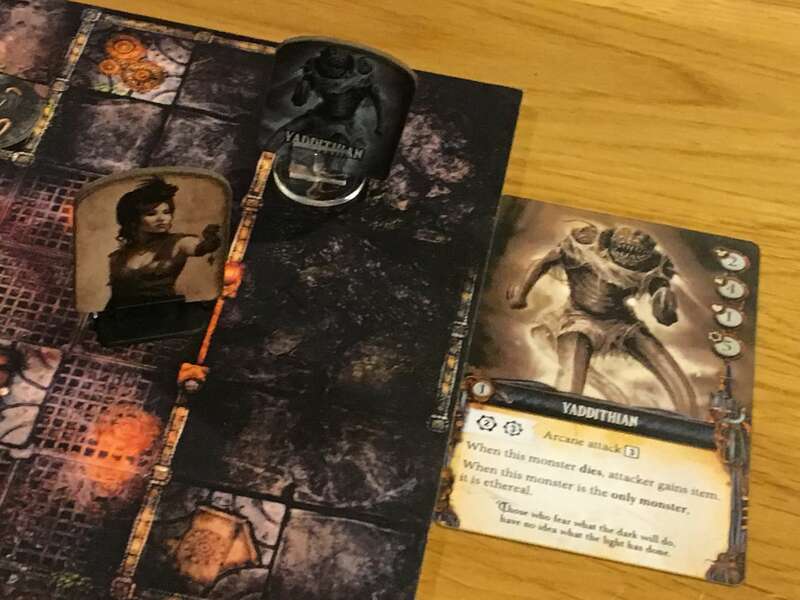 The game also uses adventurer and horror event decks to further spice things, up for better or worse, depending on which you’re drawing from. 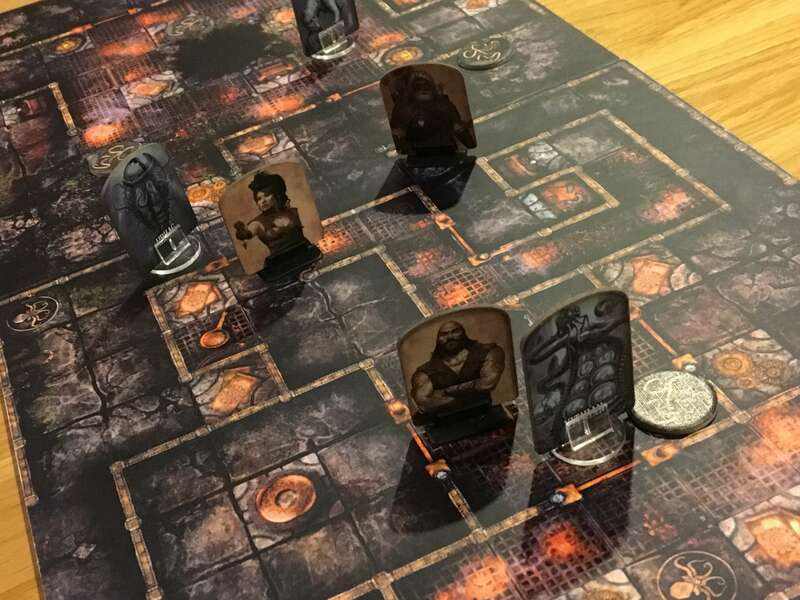 All of these events, rolls, spawns and chapters create a structure that sits around a very traditional dungeon crawling experience. The players are represented on the board by cardboard standees that match artwork on a personal player board that tracks their health, stamina and essence. Enemies also appear on the board once spawned, but environmental features like barrels, scrolls, chests and similar are all pre-printed on the boards and then covered when used. There are five boards to work through, each of which is double sided and drawn randomly when it comes in to play. If the explorers can survive through all of the chapter cards and resolve the endgame (which often takes place on a specific board), then escape (if the scenario requires it) then they will win. Along the way, they’ll defeat enemies or flee from them, they’ll collect powerful items from chests and upgrade them at workbenches, among lots of other things. A lot of the complexity in Machina Arcana comes from understanding what each of the board features does and how to use it to maximum advantage. It’s always hard to speculate about the finished component quality of a game that is still in development, but given that the game I’ve been testing is the second edition of Machina Arcana, I can speculate a bit based on the combination of what I see before me and what was included in the original game. The first major difference that returning players will notice is that the art style has been updated quite dramatically. In the original game, the art featured an attractive but somewhat sombre pencil on sepia kind of look, whilst the second edition uses moody, but nonetheless full-colour artwork. Much as it was in the first edition, the art quality is very high, with player characters that are highly individual and very detailed. The monsters, on the other hand, are fantastically terrifying. As I said in my intro section, a lot of games are tackling Cthulhu nowadays, but I don’t know if I can name another one that delves as deeply as Machina Arcana does into the extended mythos. From the relatively common Deep Ones to the much weirder and more powerful creatures that occupy the darkest places in the game, all are terribly well realised and frighteningly ugly. Actual build quality in the version I have is fairly high, even for a preview copy. The boards are solid, although if I had a negative comment it would be that individual features fail to stand out in the colour scheme – hopefully, this will be resolved in the final printing. Cards and standees, on the other hand, are all of what I would consider to be retail quality, though I don’t believe my version of the game contains the full, final quota of characters and monsters. The rulebook is clearly still a work in progress, but I learned the game well enough from it and found relatively few areas of confusion. Each turn in Machina Arcana is structurally simple, though there can be some complex elements to resolve within each of the four phases. The four phases include player actions, then spawning, then monster actions, then the horror phase. Each of these phases occurs on every player turn (which is notable, since many games would have each player take an action before spawning, monster movement and so on.) I’ll explain the phases at a high level of detail, but rest assured there are a few nuances in Machina Arcana that allow players a fair bit of power over what they do or don’t do on a turn. When taking her action, each player will begin with a set amount of stamina which is the sum of the starting character value and any items or effects that impact it. Usually, stamina is around six and movement costs one stamina per space, whilst attacking will cost two to four stamina depending on item or weapon used. Opening chests or activating a scroll space (which draws from the explorer event deck) also costs stamina, but it will also often restore essence (which begins at zero) and bestow powerful benefits like items, permanent boosts and more. When their stamina is spent, the active player will roll for monster spawning. This is done by throwing a ten-sided dice and comparing the result to the current spawn rating. If the roll is lower, no monster appears (but the spawn track moves down one) whilst if the result is higher, a monster of the current level will appear on the spawn point nearest to any player and the track moves up one. With the spawn done, regardless of whether a new monster appears or not, any monsters on the board are then moved towards the nearest player (unless their card states otherwise) until they can use one of their attacks. Whenever combat happens (be it because a player attacks a monster or when a monster attacks a player) then the relevant number of heavy and light attack dice (as specified on the monster, player or weapon card) are rolled, with the resulting sum then compared against the defence value of the defending unit. Successful hits remove one health, which will kill most (but not all) monsters outright. After the monster movement, the horror phase activates, requiring another die roll. In this case, the horror level is usually set based on the current chapter of the scenario, but it can be affected through the course of the game. Again, a ten-sided dice is rolled, with the outcome being good or bad depending on whether it is lower or higher than the horror track. Again, the current position moves based on the outcome. If a horror card is drawn, then the player will resolve its effect(s) which can include anything from health loss or permanent stat degradation to instant loss of an item in hand. Once these phases are complete, play moves to the next player who then repeats the process and so the game continues. I have (as always) hugely simplified this, but if you imagine that this basic structure expands and becomes more and more complex as new chapters introduce additional rules and items or other effects need to be taken into consideration. All the while, players need to consider what they must do in order to advance the chapter – could it be to destroy all spawning points or just to explore the next map tile? Either way, the nature of Machina Arcana means that there’s simply no time to dither – the die rolls will certainly add up against you if you don’t take decisive action. Machina Arcana reminds me very much of an ancient and more or less completely ignored game called Advanced HeroQuest, which is a lot like the far more mainstream and vastly more popular HeroQuest. HeroQuest, by modern standards, was far too simple and unpalatably random, whilst Advanced HeroQuest was arguably too complex for players in its target audience to accommodate. Machina Arcana treads a fine line around some of these subjects because dice rolls play a huge part in the outcome, as does a laundry list of complex actions that the players can take. Thankfully, I think it just about manages to stay on the right side of these potential problems because of how much control it gives the players and because of the way that the various tracks move in order to lessen the impact of repeated bad rolls. It is possible in Machina Arcana to repeatedly roll badly and effectively condemn yourself to an early demise, but it would be very, very unlucky indeed, if that did happen. Even if multiple monsters are spawned, killing them grants essence, which can be used for various powerful things in the game – so there’s always some trade off. When it comes to players evening the score, searching chests will reveal two item cards, which can be made increasingly more powerful at workbenches. I found it a bit odd that player characters begin with no items (I don’t think I missed anything in the rules there) but in the first game I played, I quickly learned how powerful items are and why it’s necessary to go after them and to upgrade them. As a side note here, I think the game could be more clear (and more simple) when it comes to actually equipping items (and unequipping them) which seems unnecessary to me. The scenario and chapter structure work well in Machina Arcana, although I did find some of the chapters to be a bit weak in terms of how the text links to the next progression point. What I mean by this is that is that some of the objectives are very “gamey” and they serve to slightly reduce the suspension of disbelief, which is otherwise well-handled thanks to the immersive art and powerful overall theme. I enjoyed my time with Machina Arcana Second Edition quite a lot and I am now very interested in seeing how the finished article pans out. The promise of two more scenarios, a host of additional enemies and at least one (but probably more) playable characters to test is very promising, as is the prospect of even more gorgeous artwork to work through. There are a ton of items and monsters that I haven’t yet faced in the games that I played and I’m eager to see how they all come together. On the possible downside, the random nature of the game might become draining at some point and whilst I am keen to see the other two, I’m not sure if three scenarios will add enough variety. This point is compounded by the fact that there are “only” ten board sides and their features can’t be changed, which could lead to repetition. That said, is this a valid complaint or is more just because we’ve been spoiled by the modular nature of certain games for a long time? I suspect it’s the latter and not really Machina Arcana’s fault. If you’re looking for a dungeon crawler with a convincing and compelling Cthulhu mythos that is probably just a tad over medium complexity, then Machina Arcana is certainly worth a look. It offers a stiff challenge, without being overly unfair or random, and it has a satisfying story structure that brings its systems together nicely. Whilst it isn’t available yet, it will be Kickstarting soon and we’ll be sure to link you as soon as it is live. 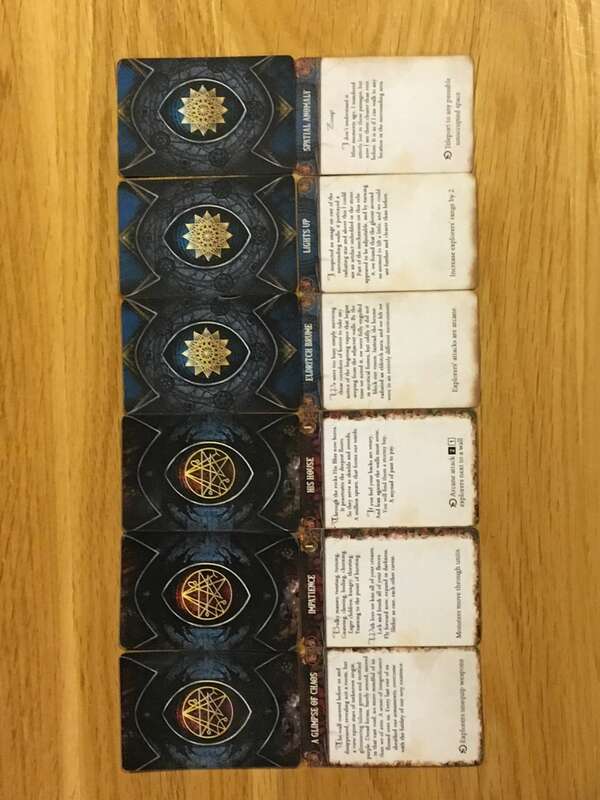 A preview copy of Machina Arcana was provided for review purposes. You can find out more about Machina Arcana on the game’s website.